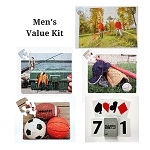 Includes Rainbow Bingo, two puzzles of your choice (choose above), MindStart Easy Word Search set, and Look and Lace set (nearly a $10 savings over buying the items separately). Rainbow Bingo: an adapted Bingo style game with 2 levels of play to meet the needs of people at varying stages of dementia. 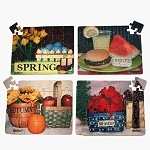 Large piece puzzles: MindStart puzzle products have a unique design to make them successful for people with dementia. The image is specially designed to have separate areas of color, making the puzzle easier to set. Easy Word Search set: MindStart word searches have less complexity and are focused on familiar themes. Includes 40 puzzles at four levels of difficulty. to allow use for people at various stages of dementia. 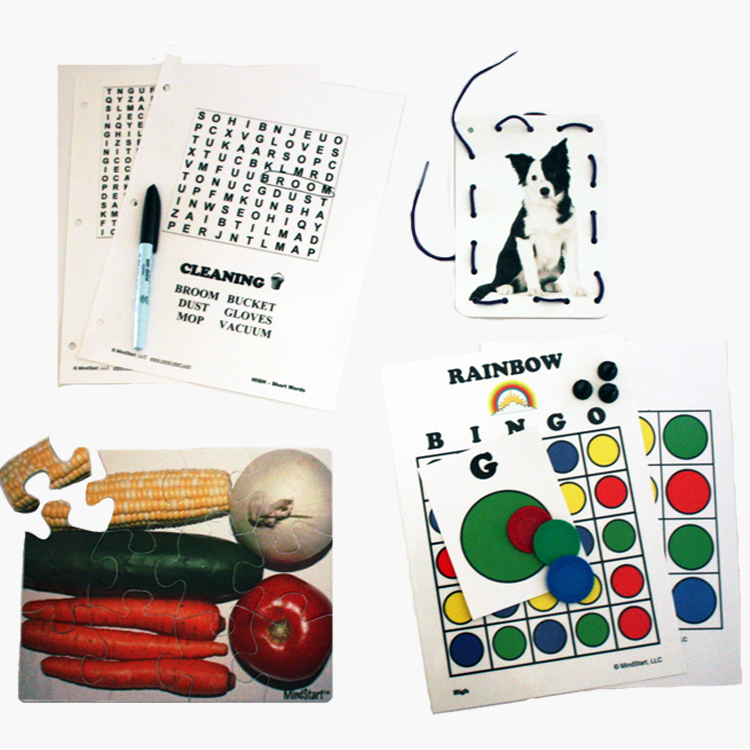 Look and Lace: Hands on activity products provide cognitive stimulation to patients, such as: eye-hand coordination; sequencing; problem solving; and fine motor finger skills. The repetitive nature of lacing activities is especially good for patients who are lower functioning due to Alzheimer's, Parkinson's, or are recovering from a stroke or head injury. MindStart products are designed by an occupational therapist to help people at all stages of dementia to use the skills they have at the time and stay mentally active. They are simpler, adult-oriented, offer a challenge at the right level, and provide support for caregivers. Therapist Tip: The Basic MindStart package offers activities for many different skill levels and that use different parts of the brain. 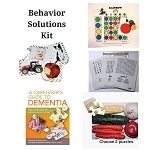 It can be used with people with all forms of dementia, including Alzheimer's and Parkinson's; with patients in therapy recovering from a stroke or head injury; and with adults with developmental disabilities.